I was recently asked, given what I went through because of my sexual assault, if I trust again. I was pretty sure what I was being asked, but I replied, ‘You mean people in general?’ Hesitantly, he said, ‘Yes.’ I suspect he was asking if I trust men again. What I told him was, ‘Yes.’ He thought maybe I look for ‘the lie’ when dealing with people. No, no, I don’t think I do. I’ve thought about it a lot in the last 10 days or so since the question was posed to me, and the longer I think about it, the more I know this is true. I have definitely been accused in the past of being naive. Seems hard to believe that someone would think that of me just because I tended to expect the best from people, and tended to give people the benefit of the doubt. As Anne Frank said, “Despite everything, I believe that people are good at heart.” I do my best, though I am not always successful, to live my life this way. The truth is, even immediately following my assault, when I was still in shock, afraid of most everyone, men, women and children, I still knew, deep inside, that in spite of what had happened to me, most people were not bad. And just as I really hated living on Coronado for a long time after 24 September 2011, I also knew that it wasn’t the island that had done something to me. It was one person; well, and the entire process did not help, but it was never Coronado that hurt me. Didn’t make it any easier to live there though, until I got through it. I can’t even tell you exactly when it changed back for me, but one day I was walking home from uptown and it suddenly hit me that I no longer wanted to move away anymore. I believe what I am told…is this the same as trusting someone? I don’t think people are going to lie to me. If you tell me something, I trust that you are telling me the truth. Somerset Maugham said, “It’s a funny thing about life: if you refuse to accept anything but the best, you very often get it.” I prefer to live my version of his quote: It’s a funny thing about people: if you expect the best from them, you very often get it. Or as Claude M. Bristol said, “We usually get what we anticipate.” I think Anne Frank, Somerset Maugham and Claude M. Bristol sum up the way I used to be pre-attack, and the way I have, finally, gotten back to after a whole lot of work. Part of what made my healing process so difficult was getting my head around the fact that it happened to me at all. The only thing I did ‘wrong’ that morning was be tall, thin and blonde, and was be in a place that a predator was looking for just that type of woman. I never expected it to happen to me. Never. And in spite of doing everything I was ever told or ever heard about how to behave in a situation like I found myself in, nothing worked, starting with no warning bells going off in my head when I first encountered DCD. I attribute that to the fact that I didn’t expect to be attacked. I trusted that I was safe. Turned out I wasn’t, and my world turned upside down as a result. What I do know with absolute certainty is I cannot, I will not, live my life being afraid. Part of the reason I worked as hard as I did to heal from this was because no way was I letting one person, one awful event, determine the rest of my life. I was very lucky that at the time of my attack, I was in a healthy, happy, loving relationship. I know that my healing process would have been very different, and much more difficult, had that not been the case. The fact that my boyfriend was very supportive and encouraging made all the difference, and even though, ultimately, the relationship did not survive, he was there for me through the worst of it. For that, I will be eternally grateful to him. 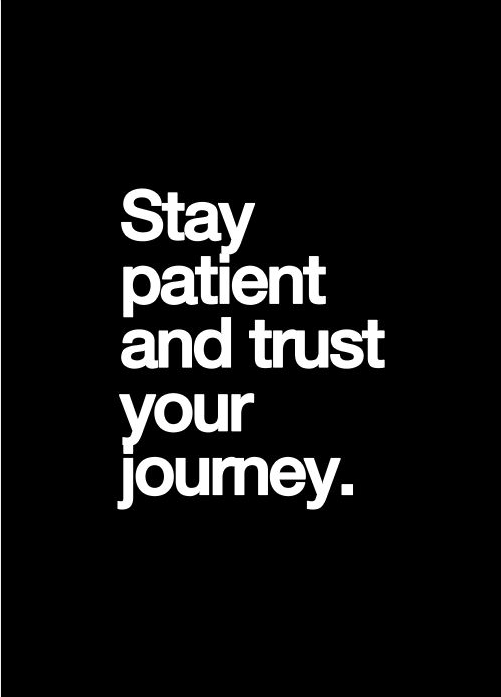 And while the patience part is challenging, I do TRUST my journey. I loved this book by Bessel Van Der Kolk, M.D. I just finished listening to it yesterday, though during the middle of it, I ordered the actual book, too. I knew it was one I’d want to have and be able to reference. It was a tough listen as times, but it explained a lot of what I’ve been through and continue to go through. What makes this book even more relevant to me is the fact that it was just published in 2014, which means it has the latest information about trauma that is available. “This profoundly humane book offers a sweeping new understanding of the causes and consequences of trauma, offering hope and clarity to everyone touched by its devastation. Trauma has emerged as one of the great public health challenges of our time, not only because of its well-documented effects on combat veterans and on victims of accidents and crimes, but because of the hidden toll of sexual and family violence and of communities and schools devastated by abuse, neglect and addiction. Drawing on more than thirty years at the forefront of research and clinical practice, Bessel Van Der Kolk shows that the terror and isolation at the core of trauma literally reshape both brain and body. New insights into our survival instincts explain why traumatized people experience incomprehensible anxiety and numbing and intolerable rage, and how trauma affects their capacity to concentrate, to remember, to form trusting relationships, and even to feel at home in their own bodies. Having lost the sense of control of themselves and frustrated by failed therapies, they often fear that they are damages beyond repair. 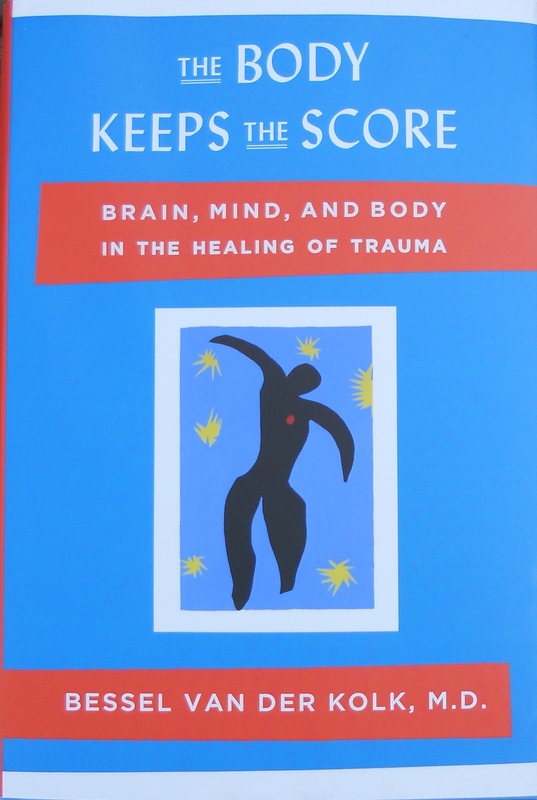 THE BODY KEEPS THE SCORE is the inspiring story of how a group of therapists and scientists–together with their courageous and memorable patients–has struggled to integrate recent advances in brain science, attachment research and body awareness into treatments that can free trauma survivors from the tyranny of the past. These new paths to recovery activate the brain’s natural neuroplasticity to rewire disturbed functioning and rebuild step-by-step the ability to ‘know what you know and feel what you feel.’ They also offer experiences that directly counteract the helplessness and invisibility associated with trauma, enabling both adults and children to reclaim ownership of their bodies and their lives. What this book also showed me is the things I did, EMDR, yoga, to name just two, were the ‘right’ ones to undertake and have contributed mightily in my healing process. I also realize I still have more healing to do –dang it– but that it is possible to rewire the neuro pathways in my brain even more than I’m sure they have already been rewired. It is a process and as much as I want it to be finished, the simple truth is it’s not. I think, too, that for people who are on a healing path, it is lifelong endeavor, whether you suffered a traumatic childhood event, a devastating car accident, the death of a child or spouse, or just the day-to-day living of life that can sometimes be unbelievably difficult. I’m realizing more and more that we are never really finished. As I always told my therapist, I do not have a choice in this. I have to keep moving forward. I highly recommend this book for anyone who has suffered a traumatic event personally or knows of someone who has. The knowledge and insights you will gain will be invaluable to understanding the why of how trauma affects the body and mind. Why is it, generally speaking, that Western medicine tends to throw pills at the symptom and not get to the underlying condition that may be causing the problem to begin with? Is it because we are lazy and want a quick fix? Is it decades of training doctors in a certain way? Is it an inability to change with the times? Is it fear of some kind? Don’t get me wrong, I myself took an antidepressant because I needed it to get my chemical imbalance, well, balanced. I suffered for years from depression and/or clinical depression, and it had gotten to the point that even though I so did not want to take it, I knew I had to. I fought it for a long time, but when I was in Key West in the bright February sunshine, out of the frigid Chicago winter, and I was still feeling awful, I knew the time had come. At the time, I was seeing a therapist and he recommended a psychiatrist to me. I reluctantly went. The deal was I would continue with my therapist and I would see the psychiatrist once a month. I made sure my doctor knew from the very beginning that I had no intention of staying on the medication indefinitely. I asked how long I would have to take it. My doctor told me, and keep in mind this was in 1997, usually people took it for about a year, maybe a little longer. I said, okay, but I’m not taking it any longer than that. At the time I was trying to get pregnant and, again keep in mind it was 1997, at the time the only antidepressant that was approved for and that had been tested on pregnant women was prozac. So that’s what I was given. Pretty sure I’ve mentioned this before, but it nearly killed me. Every bad side-effect it was possible to get, I got. I know now I should never have been given it at all, since I am in the bi-polar spectrum, and prozac is a huge no-no. Not sure if this wasn’t known back then or that my doctor just dropped the ball, in a way. It doesn’t really matter. What matters is I was closely monitored and switched to wellbutrin as soon as it became clear that I was on the wrong medication. What I find astounding is the number of people, mostly women, who have been on antidepressants for years. YEARS! And they have no intention of ever getting off of them. I understand that there are legitimate reasons for being on a drug long-term, maybe even forever; but, mostly, I don’t believe this to be the case. (Bi-polar disorder is a different story and those with it should take medication, though many don’t/won’t.) I could not wait to stop taking it, even after finding the correct one for me. It was a hateful drug, and though it accomplished what I needed, the re-balancing my chemicals, I was not sorry when I no longer had to take it. “Attention deficit hyperactivity disorder (ADHD) is one of the most well-recognized childhood developmental problems. This condition is characterized by inattention, hyperactivity and impulsiveness. It is now known that these symptoms continue into adulthood for about 60% of children with ADHD. That translates into 4% of the U.S. adult population, or 8 million adults. However, few adults are identified or treated for adult ADHD. Okay, the truth is I probably had/have ADHD, but even if this is the case, I have learned how to manage in spite of it. I have a friend who kind of makes fun of me because I have, in her words, a very rigid routine. What I now understand is, in order for me to function at the level I need to, to be able to be self-employed, it is imperative that I have a fixed routine. I don’t consider it to be rigid, but I do my best to stick with it on a daily basis, otherwise nothing gets done. Or at least not a lot gets accomplished. Would a drug like Adderall help me? Maybe, but I prefer to have my ‘rigid’ routine. And let me say again, I do believe there are people who legitimately need to be on one of these drugs. At the same time, I believe that many are misdiagnosed/overdiagnosed by physicians who simply do not know enough about it. I feel like there are so many other available choices, such as diet, exercise, therapy, that may help, if not alleviate the problem all together. Ultimately, though, we each need to do what we decide is best.